The deceased have been identified as Jinnappa Sattur, Gauravva Sattur, Chandrashekhar Sattur, Vaibhav Sarapure (4), Yuti Sattur (3) and Ravi Sattur. 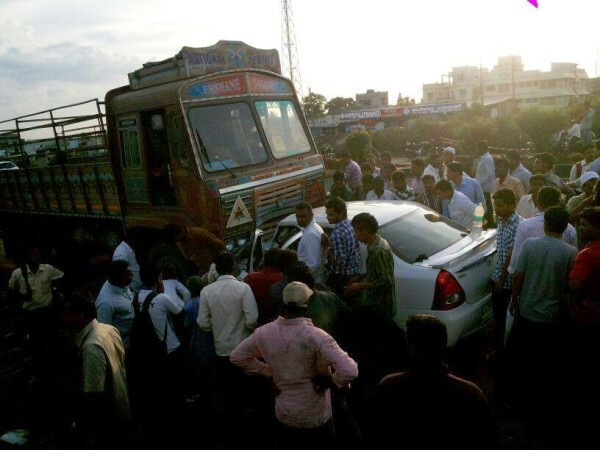 All the deceased are the residents of Dharwad who were returning from visit to Satvandhi -Nippani. The driver lost control as the tyre bursted sources said and the car rammed into the parked Truck. Similar accidents of cars hitting the trucks have happened near the same spot earlier as well. The truck was parked on the wrong side and that too on the right lane !!! How can these people be so careless ? And, whats the police doing ? Feel very sad. Not sure how many thousands of lives are required to improve road safety standards in India, Shivane!